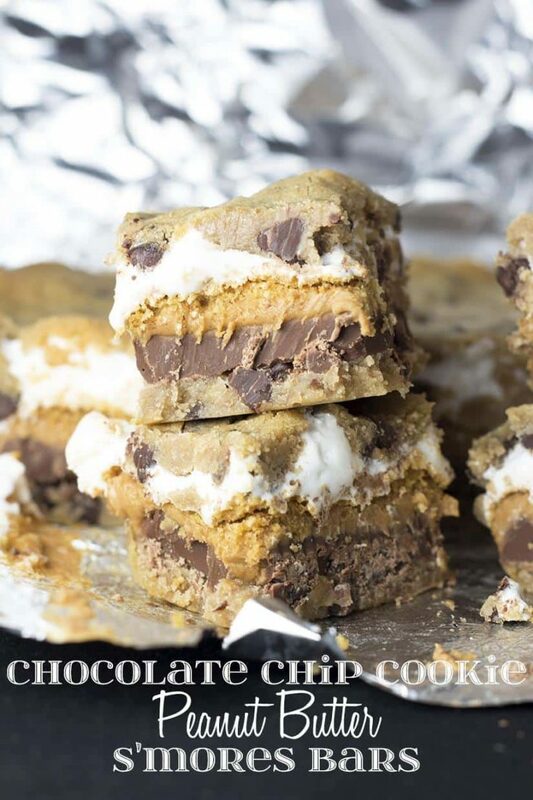 Chocolate Chip Cookie Peanut Butter S'mores Bars - Chocolate Chocolate and More! I’m so excited to to be here today, and share this delicious recipe with you! My name is Hilary and I’m the blogger behind Embellishmints, a fashion and lifestyle blog where you can find delicious recipes and tips for enhancing your lifestyle! Go ahead and check it out, and then make these Chocolate Chip Cookie Peanut Butter S’mores Bars because they’re amazing. Look at these layers – chocolate chip cookies, chocolate, peanut butter, marshmallow creme and more chocolate chips! Replacing graham crackers with chocolate chip cookies takes these bars to a whole new level. The peanut butter gives it that fluffer-nutter taste you remember as a kid. I’m obsessed with S’mores Bars because they’re so easy to make and absolutely delicious. Seriously they are always a hit, you will love them! Plus there are only 5 ingredients. You can’t beat that. TIP: Spreading peanut butter and marshmallow fluff can be really difficult to spread so to make it a little easier I suggest you transfer each into a separate microwave safe bowl and microwave 10-15 seconds. The heat will soften them enough so they will spread easily! Bake for 20-22 minutes, allow to cool for 2 hours on a wire rack then transfer to a refrigerator to cool for at least another 2 hours. Wow. My head is about to explode with all that chocolate and peanut butter goodness. Just… wow.